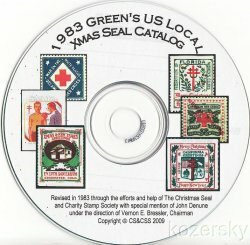 League For Friendly Service TB Charity Seal Collection, full gum, F, MNH. Issued between 1940-51 by the League for Friendly Service, Bloomfield, NJ. 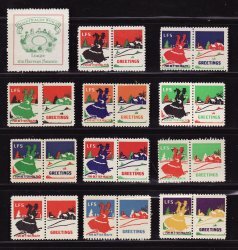 Green's Calatlog #s: 2-LFS 815-26, multicolored TB Charity Seals. 1940-51 League For Friendly Service TB Charity Seal Collection, full gum, F, MNH. Issued between 1940-51 by the League for Friendly Service, Bloomfield, NJ. Greens Catalog #s: 2-LFS 815-26. Multicolored, fully perfed pairs, TB Charity Seaqls. Seal #815 is 30.5 mm sq., perf 12;, seals #814-26 are 17x23, perf. 141/2, F, MNH.